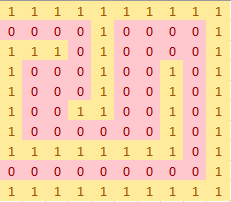 In Pathfinding from Hell, you are challenged to create a pathfinding algorithm in pure TI-BASIC, but with some restrictions. 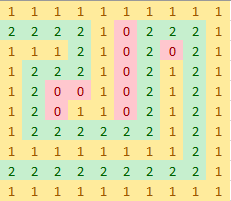 This algorithm should find it's way through a matrix with walls, and a starting/ending point. To win this contest, your algorithm must be the fastest and smallest, and follow the rules. The final submission date is March 24th, which means you have exactly 3 weeks to complete it. The path should be singular, which means you are not allowed to simply change the 0's to 2's, that is not a pathfinding algorithm. The first and second place winners will receive $30 and $15 respectively in the form of Steam gift cards. The contest will run until 3/24/2017, at 23:59:59pm Eastern Time. No late entries will be accepted. Submit entries by emailing them, in a zip file, to contest at this domain. Please put your Cemetech username in the email topic or body. If you multiple entries are recieved, only the last one will be judged. If you want to participate, please post it in this thread, such that we know it. Entries including one of the above stated TI-BASIC tokens will be disqualified. Judging will be done by the aforementioned Cemetech members: PT_, Pieman7373 and mr womp womp. You can find the scoring details below. All judges are disqualified from participating. Results will be posted no later than 10 days after the end of the contest. Contestants may not release binaries until the end of the contest; posting small code snippets to ask for help is allowed. Fine print rules can be found here. See this link for a VBS script how we will calculate the score. deleted by poster as PT_ did cool stuff and fixed it. [edit^2] And if it isn't clear, I'm entering if I can get my program optimized. I'm going to type "CC19" here so that I can easily find this thread later. Programs have to be written SPECIFICALLY for this... no recycling! Ok. I know you guys haven't seen my previous pathfinding thingies (I haven't shared them) but you have my word that I will not use them/parts of them. I would like to participate in this contest since I'm not running it this time. That is what i thought last contest (because i was going against PT_ ) but i ended up winning, so dont lose hope _iPhoenix_! No newline?! I'm literally going to kill myself. Kerm might kill everyone, but it will be worth it! I won't. I do have a little experience, and I hope that gives me a tiny advantage, but my guess is that everyone else participating will have some, too! Yep, entries will be tested with a CE with OS 5.2.1.0042, which includes some new TI-BASIC tokens. There used to be this really amazing optimizer, but I guess they removed it. Not for testing. I use it all the time! Ya know, "Slow and steady wins the race Cemetech Contest"
© Copyright 2000-2019 Cemetech & Christopher Mitchell :: Page Execution Time: 0.110606 seconds.